I’m currently making my first VR project for regular collaborators Sydney Harbour Foreshore Authority (SHFA). It has extended my thinking around the notion of immersion, which is such a catch cry these days. There are at least three ‘meanings’ we can ascribe and reflect on. For psychologist and affect theorist Daniel Stern immersion is being in an environment that is very static, unchangeful, with very little incoming stimulus, so that one’s perception is turned inwards to more reflective and introspective tropes. For mixed reality, immersion is the desirable aim of dissolving the edge of the frame, merging screen space and actual space, somewhere between full VR with the environment responding to our movements, and AR with its overlay of the virtual and the actual. To this end, immersion in mixed reality is being very impactful on research for teaching in immersive spaces, etc. Finally, it is useful to think of immersion historically, in light of new media archeologies. 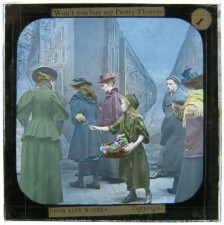 When the 19Cth afforded everyday people the experiences of mobile leisure and new ways of seeing through mechanised amusements, train travel and plate glass for window shopping and its mini-me manifestations in ferneries and aquaria, there were opportunities for new modes of lived experience. Blurred vision and vertigo from the speed of amusement rides, all enveloping darkness in dark rides and ghost trains, peering into stereoscopic screens or magic lanterns, all were precursors and prophets of the 20C and 21C obsession with experience and feeling. This slide is from Martyn Jolly’s website; Martyn is doing an ARC project scoping and analysing national magic lantern collections. 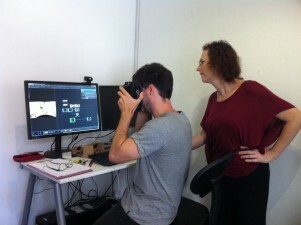 at MOD Productions with co-creator James Brown and developer Michela Ledwidge. 2011 – In the last 12 months I have exhibited several new works, including “Spirit Patrol” a new video in the Life After Wartime suite with Ross Gibson, at the Plimsoll Gallery Hobart; “Bloodbath” a live event with Roller Derby, wiimote and VJ at Sydney’s Hordern Pavilion with Linda Dement, and invited artists Nancy Mauro-Flude, Sarah Waterson and Francesca da Rimini; “Travels In Beautiful Desolation”, a video flythrough of the fictional and speculative galaxy Gondawanna, at DreamWorlds Beijing and regional China in 2010. An old but favourite piece “The Coal Cliff” made in Super 8 with Kurt Brereton was exhibited as part of an exhibition at Wollongong Regional Gallery. Design and production gigs included the video design for “Ama and Chan”, a new performance work for Urban Theatre Projects Sydney; interactive multimedia design for “Mr Dawes Pronounces Well” stage 2, a live performance in development at Critical Path Sydney with director Kerreen Ely-Harper. I am also consulting multimedia producer to David Clarkson of Stalker Theatre Co for their new work “Encoded” using kinect box and interactive 3d imaging. I’m pleased to be a part of the Sydney Harbour Foreshore Authority Arts Incubator for 2011 and with a great bunch of other artists we are seeding creative concepts for The Rocks in Sydney. My PhD research on affective flows and affordances is progressing well and I will present it at ISEA Istanbul in September 2011.